If there is one tool you will be using a lot as a domainer, it’s the Overture tool, found here. What is an Overture Score? To help pay per click advertisers choose appropriate terms to bid on, the Yahoo! network keeps track of all of the keywords that were searched on their network, and how often they are searched. They make this data publicly available on the Overture tool. This tool allows you to input a keyword and then outputs how often in a previous month that keyword and similar keywords were searched. The number of times the keyword was searched is known as the “Overture score.” So, for instance, if today you search the Overture tool for the keyword “widget,” it will tell you that this keyword was searched 20,455 times in a previous month. You will sometimes hear the term “Overture with extension.” This means that the full domain name, including the extension, was searched for on the Overture network. So, for instance, if today you search the Overture tool for the keyword “ebay.com,” it will tell you that this keyword was searched 2,849,826 times in a previous month. Why does Overture Score Matter? The Overture score of a domain is one factor (of many) that is used in valuing a domain. If people are not searching for the keywords that appear in your domain, then generally your domain will be of a lower value. Conversely, if there is a really high Overture score for your domain, this will tend to increase the value of your domain. As well, for purposes of ranking a domain in the search engines, a domain that exactly matches the keywords searched for will tend to rank well, which helps increase the value of the domain name. Aaron Wall provides an example of how having an exact match domain helps him capture the top 13 listings in the search results. As he discusses, exact match domain names also tend to be more successful when doing arbitrage. Overture with extension is particularly valuable, as that means that people are searching for that domain in particular. This can happen because either people mean to type the domain name in the browser bar but accidentally type it into the search bar, or it can happen because people don’t know better than to go to a domain via a search engine. Seeing an overture with extension gives a hint that there may be type in traffic for the domain – that is, people going to the domain directly just based on the power of the domain name. What are the Limitations of Overture? 1. Overture Score Can Be Manipulated. This can be done both intentionally and unintentionally. People can purposefully increase the overture score by running a bot that continually makes searches for the term over and over throughout the month. This may be done to inflate the value of a domain or simply to throw mis-information into the system for their competitors – so that their competitors work on ranking for terms that look like they have a lot of traffic but do not. As well, a lot of terms can be inflated by “ego” searches of webmasters – for instance, the high Overture score of a term like “seo” is probably due to a lot of webmasters continually checking out the rankings for this keyword rather than people looking for SEO services. 2. Limited Sample Size. The tool is made by Yahoo! and as such can only deal with the traffic across the Yahoo! network of websites. Given Yahoo!’s shrinking share of the search pie and its lack of appeal to certain demographics, there may well be sampling errors. 3. It’s Broke. The tool, when it’s working at all, goes very slowly. At times, the tool goes down for days on end. At this point in time, the data has not been updated since January 2007. 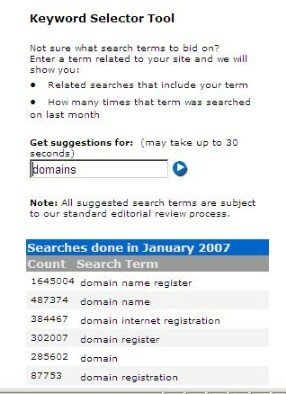 If you are looking for other similar resources, try Keyword Discover or WordTracker Free Keywords. 4. Seasonality. The tool only gives data for a particular month. If you are searching for golfing keywords in the winter or skiing keywords in the summer, you are unlikely to get an accurate estimate of the traffic potential of these keywords. Similarly, if you are searching for “foods to avoid during pregnancy,” the results will vary depending on the number of women beginning their pregnancies. 5. Precise Keywords. Funnily enough, the Overture tool does not show exact keywords used. They may change the word order – for instance, “blue jeans” and “jeans blue” data would normally be aggregated together. As well, the tool does not normally differentiate between singular and plural – so the data for “house” includes both searches for “house” and “houses.” As well, Overture often ignores certain words that searchers are typing – such as prepositions and pronouns. 6. Country Specific. The Overture tool linked to above is for searches that originate in the US. There are also other country specific databases, such as for the UK and for Germany. Just because a domain name has an Overture score doesn’t mean you should rush to register or buy it. But it is a good starting point in deciding whether a domain has value. Big problem — take a look at that date: January 2007. The Overture search tool is *dead. * Every month that goes buys the data gets less and less meaningful. @Andrew – I don’t think that 10 months ago is all that long, even in internet terms, so the data is still valid. As well, it’s a commonly used term in the industry that newbies should understand, including its nuances. That being said, you do raise a good point – unless Yahoo! does something, the results are growing more and more meaningless over time. There are a lot of good alternative tools that are useful for doing keyword research and they definitely should be used. I’ve never actually tried the MSN Adcenter tools. What do you think of them? How do they compare to WordTracker or KeywordDiscovery?